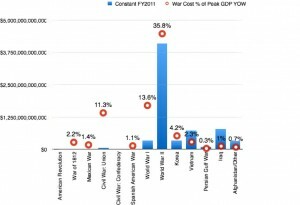 Did our Invasion of Iraq Cost More or Less than Vietnam? Woke up with an irritating insect buzzing in my head this morning. It was the cost of American wars. Weird! But, unable to sleep because of all the racket, I got up, climbed upstairs with my laptop and did some research, creating this graph based on data I gathered from a 2010 Congressional Research Services report. The reason that mental insect was so darn irritating was the same reason that I was not surprised to learn that the post 9/11 invasion of Iraq was the second most expensive American war (WWII #1), toping the next, Vietnam, by 50 billion dollars. That’s in 2011 dollars. 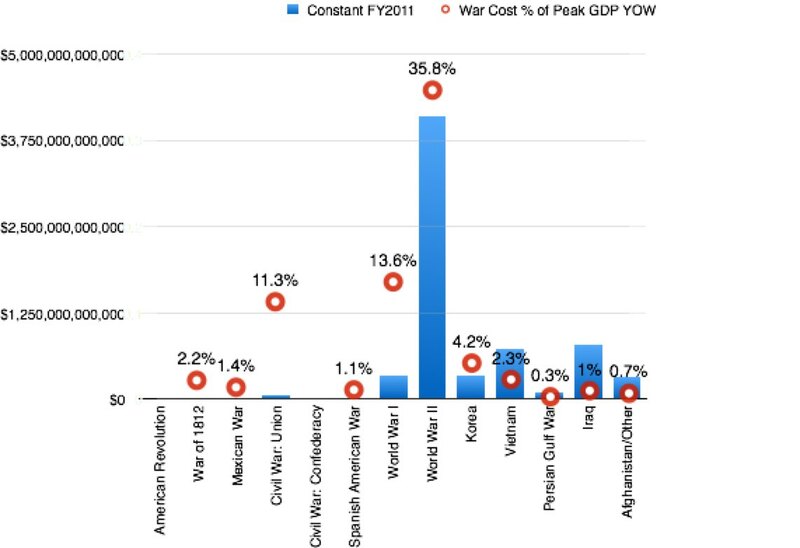 What I can’t figure out is, “Why did Iraq’s cost ($784,000,000,000) represent only 1% of its peak year’s (2008) U.S. GDP, while Vietnam ($738,000,000,000) amounted to 2.3% of its peak year’s (1968) U.S. GDP? If you have an answer, please comment here. Author David WarlickPosted on April 18, 2015 Categories Uncategorized1 Comment on Did our Invasion of Iraq Cost More or Less than Vietnam?